Nory Horace is nine years old. She’s resourceful, she’s brave, she likes peanut butter cookies. Also, she’s able to transform into many different animals. Unfortunately, Nory’s shape-shifting talent is a bit off. But she is determined to get into her father’s magic academy so that she can be ‘normal’ like the rest of her family. But when she cannot turn into a simple black kitten, Nory’s forced to enter public magic school, where she meets a group of kids whose magic is, well, different. This new, offbeat series from authors Sarah Mlynowski, Lauren Myracle, and Emily Jenkins chronicles the misadventures of Nory and her oddball friends. I love the quirky characters in this book and the message of being true to yourself is also great. This was pretty fast pace for a middle grade book and I like how the authors just jump right into the story. 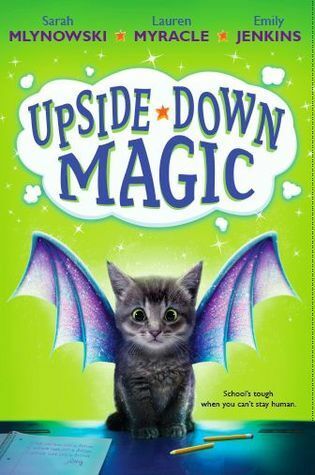 Upside-Down Magic by Sarah Mlynowski, Lauren Myracle, Emily Jenkins comes out today, September 29, 2015. This entry was posted in Magic, Middle Grade and tagged Emily Jenkins, Lauren Myracle, magic, middle grade, Sarah Mlynowski, Upside-Down Magic. Bookmark the permalink.